Seattle University (SU) is a Jesuit Catholic university located in the Capitol Hill neighborhood of Seattle, Washington, USA. SU is the largest independent university in the Northwest US, with over 7,500 students enrolled in undergraduate and graduate programs within eight schools, and is one of 28 member institutions of the Association of Jesuit Colleges and Universities. U.S. News & World Report, in its "Best Colleges 2011," ranked Seattle University 6th out of Non-PhD schools in the West that offer a full range of programs up to Master's degree. In 1891, Adrian Sweere, S.J., took over a small parish near downtown Seattle at Broadway and Madison. At first, the school was named after the surrounding Immaculate Conception parish and did not offer higher education. In 1898, the school was named Seattle College after both the city and Chief Seattle, and it granted its first bachelor's degrees 11 years later. Initially, the school served as both a high school and college. From 1919 to 1931, the college moved to Interlaken Blvd, but in 1931 it returned to First Hill permanently. In 1931, Seattle College created a "night school" for women in order to allow them to attend; becoming coeducational was a highly controversial decision at the time. In 1948, Seattle College changed its name to Seattle University under Father Albert A. Lemieux, S.J. 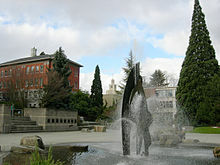 In 1993, the Seattle University School of Law was established through purchase of the Law School from the University of Puget Sound in Tacoma, Washington. In 1999 the School of Law moved to the Seattle campus. In 2009, SU completed the largest capital campaign in the university's history, raising almost $169 million and surpassing the original campaign goal by almost $20 million. The campaign has resulted in new scholarships for students, academic programs and professorships, a fitness complex, an arts center and more. The centerpiece of the capital projects is the $56 million Lemieux Library and McGoldrick Learning Commons, completed in fall 2010.